If you compare the Garmin G3 golf GPS feature-for-feature with its big brother, the G5, you'll find just a few differences. The G3 has a 2.6-inch (diagonal) touchscreen, compared with a 3-inch display on the G5. The G3 is also smaller and lighter overall (a plus for carrying). Besides the screen size, the biggest difference is stats tracking: the G5 lets you compile and display stats such as number of putts, greens and fairways hit and more, while the G3 does not. See the on-course G3 review below. High performance at a reasonable price. Free 18,000+ golf course database. Screen on the small side, but still does the job. Doesn't track stats such as number of putts, fairways hit. Included, pre-loaded U.S. golf courses. Garmin upended the golf GPS market with the introduction of the Approach G5 and its free course database with free updates (most golf GPS makers charge per year for course database access). Not long after the success of the G5, Garmin used a smaller handheld GPS chassis (similar to that of the popular Dakota handheld) to add an Approach G3 model to the line. I've had the opportunity to play a few rounds with the G3 and have found it to be a very proficient unit that gets the job done with a few sacrifices made to hit its price point. I've been pleased with the trend toward touchscreen controls in handheld GPS, and the G3 is as pure touchscreen as it gets, with just one button, for on-off. The G3 presents a simple opening screen, with "play," "preview," and a tools icon. Select "play" and you'll be presented with multiple course select options, including "nearby" and by state/alphabetical. I was impressed with the selection of courses in Pennsylvania, including some of the more obscure and smaller courses I play. When you begin play, an overview of each hole is presented in color (a drawing, not an aerial image), with distances to major features showing. You will also see the distance to the hole in the upper right from wherever you are standing. The upper left shows the hole number and touching the upper left opens up the scorecard and shot distance measurement tool. The menu and controls are intuitive and easy-to-use overall, and it's easy to advance to upcoming holes to preview them without losing data from the hole you're playing. Touch targeting lets you drag your finger anywhere on the map for a distance preview. As you approach each green, an accurately shaped green diagram appears. You may touch and drag the pin to fine-tune placement according to what you see. You may measure shot distance by selecting "begin measurement" and then watch the yards tick by as you get closer to where the ball rests. This is a fun feature that I use a few times each round. One advantage of dedicated handheld golf GPS devices, compared with smartphone golf apps, is waterproofness and durability. The Garmin Approach G3 has very rugged, rubberized chassis, and it passed my waterproofness test. You can drop this unit into the golf cart cup holder or throw it to another player with confidence that you won't damage it. Garmin has vast expertise in GPS technology, so it's no surprise that the G3 acquired and held a GPS signal very well, and proved to be accurate out on the course. 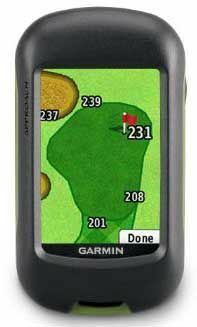 The G3's screen is smaller than the G5's and that of other golf GPS units with 3-inch screens, but I never found the numbers, which are rendered in a generous size, or the course features difficult to see on the screen. Overall, the G3 is a solid value, and is solidly built, and the always-free course database helps add to its price-value proposition. For more golf tech, check out the 8 Best Golf Tech to Buy in 2017.